When you feel tense you go to the spa to unwind and relieve all the stress that has accumulated. But you can recreate the same comfort and soothing feeling that you get when you go to the spa in your own home. You can do this by turning your old and boring bathroom into a spectacular spa bathroom. If you want to see some amazing spa bathrooms to figure out how to make yours, read the following lines. 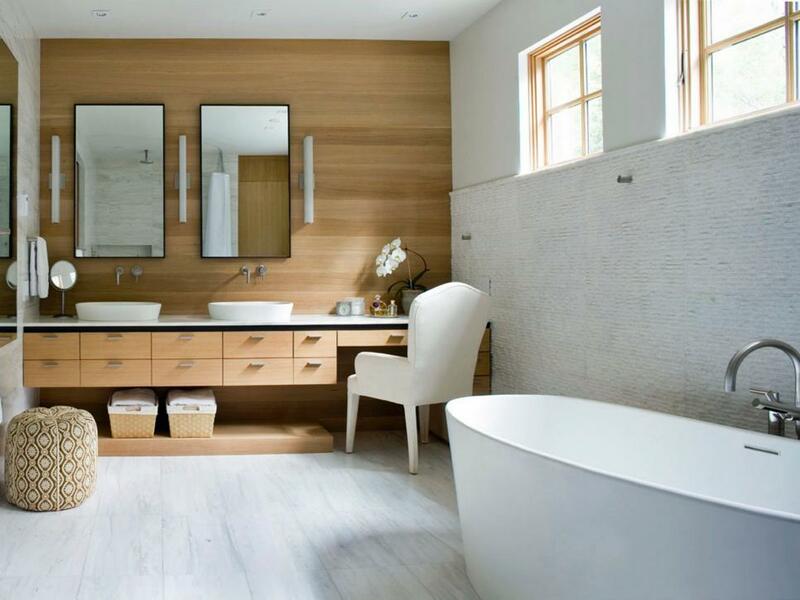 The spa bathroom shown in the picture above is the perfect example of a serene spa bathroom. It’s simple, the colors used in its making go perfectly together, and it’s incredibly elegant as well. The vanity table is linked to the counters that contain the sinks. This makes the spa bathroom truly complete. After taking a relaxing shower in the morning you can sit down on the chair to get the last details done for you to be ready for work. The small little baskets that contain the towels are positioned in a discreet and smart way. You always know where they are without them cluttering the whole place. The combination between the rift-sawn white oak, the textured white marble tiles on the wall behind the bathtub, and the striped marble slabs give the room the ideal spa vibe. Therefore, if you want a serene spa bathroom, recreate the one shown in the picture above. Another perfect example of a stunning spa bathroom is the one shown in the picture above. If you have a big bathroom, you should definitely go with this design. The large windows give you a pleasant and relaxing view of the outdoors. 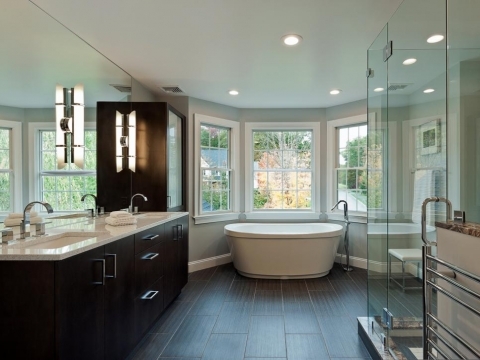 Place the bathtub next to the windows to enjoy the view whenever you’re taking a long and relaxing bath. Also, install a see-through shower in the spa bathroom. You will be able to look outside while taking a brisk shower in the morning as well. It will fill you up with energy for the day to come. To make the bathroom even more spa-like, place a large mirror above the sinks that will cover the whole space up to the ceiling. The most important element of a spa bathroom is the sauna. Saunas help you rid yourself of all the stress that has been overwhelming you. In addition, your health benefits a lot from daily sauna sessions. While using the sauna you eliminate toxins, you lose weight, your immune system improves, and your skin looks better. 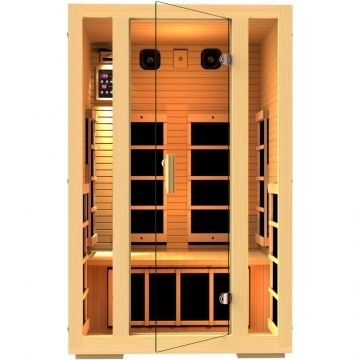 The JHN Lifestyles 2 Person far infrared sauna is considered by many people to be one of the best saunas for home. You can buy this infrared sauna for the price of $2900. 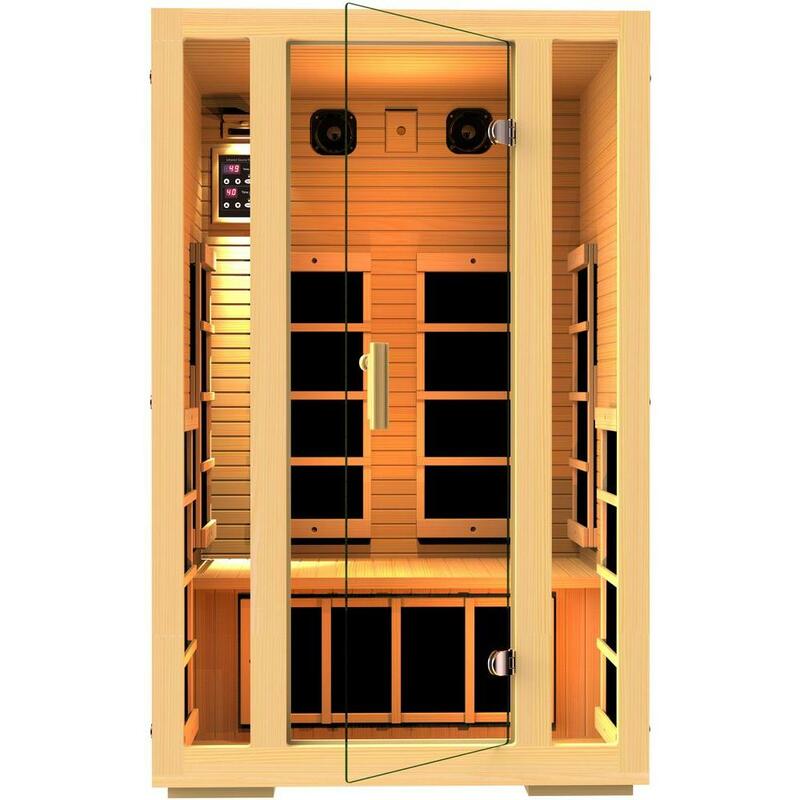 It uses 7 carbon fiber far infrared heaters to provide with the perfect sauna experience. Due to the fact that it’s an infrared sauna, it focuses on heating your body instead of the air. It’s approved by the ETL. The wood used for its production is certified by FSC for being “green”. There are no chemicals added in the process of manufacturing this sauna. It has a built-in AUX control and 2 premium speakers. This means that you can listen to music while sitting in the sauna.